Freedom for this man is to earn his livelihood on the streets of Mumbai. The Bandra Worli Sealink from the Bandra Fort in Black and White. A milch cow tethered for fresh milk in Vakola,a suburb of Mumbai. A morning at the milkman's in Vakola, a suburb of Mumbai. The Mumbai sky on 22aug10 at 7.25pm. Having fun at the Indibloggers Mumbai meet! Freedom Fighter Mahatma Mohandas Karamchand Gandhi also known as Father of our Nation, has a museum dedicated to him in Mumbai. 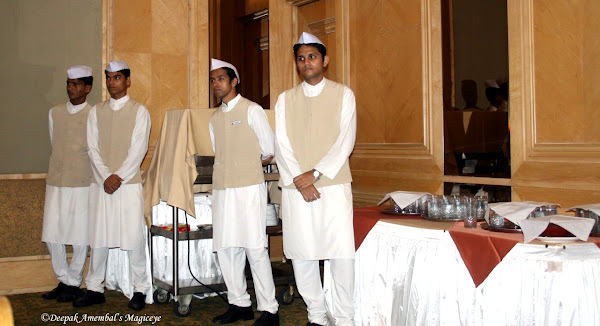 The staff of the Hotel Sea Princess attired in the National dress on our Independence Day waiting to serve the bloggers at the Indibloggers Mumbai meet on 15aug10. A niche at the Vasai fort. A crow quenching thirst at the lotus pond on Bandra fort. This is Firoze Shakir known as Photographer Number 1 introducing himself at the Indiblogger meet held in Mumbai. He is a very prolific photographer. He has something like 129844 images on flickr! He is a poet too! A multi talented street photographer! A wonderful human being! An avid photographer at the Bandra fort trying to capture the ambiance. Eroded pillar at the Vasai Fort. A lovely place on the Bandra Fort where one can sit and meditate for hours looking at the Arabian Sea. The fantastic Indiblogger team that hosted a superb Mumbai meet on Independence Day at the Sea Princess. Since the Indibloggers wear Black Tees, I thought a Black and White image would suit them the best! Today is our Independence day. 63years of Independence! Pictured above is the evolution of our National Flag from 1906 to 1947. Clicked it in Mani Bhavan. The 1st flag was designed in 1906 followed by 1907,1917,1921, twice in 1931 and finally in 27jul, 1947. Heres wishing all Indians a very Happy Independence Day and a super year ahead!! A lamp stand outside a temple in the Vasai fort. In a restaurant in one of the malls in suburban Mumbai. Driving down the Bandra Worli sealink. Laburnum Road in Girgaum, South Mumbai, where Mani Bhavan (Gandhiji's residence in Mumbai) is located. The sky in Vasai a month back!